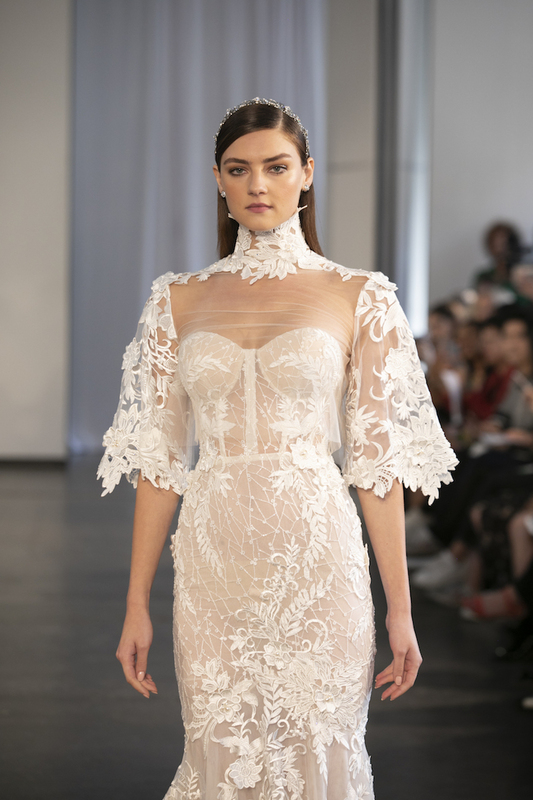 Bridal Fashion Week just wrapped up in New York, and we spent the past six days dashing around Manhattan from show to show to check out Fall 2019 wedding dress collections! We swooned over stylish gowns and polished pantsuits, and in addition to seeing designers embrace diversity and size inclusivity on the runway, we spotted a number of trends that soonlyweds can get excited about for fall 2019. 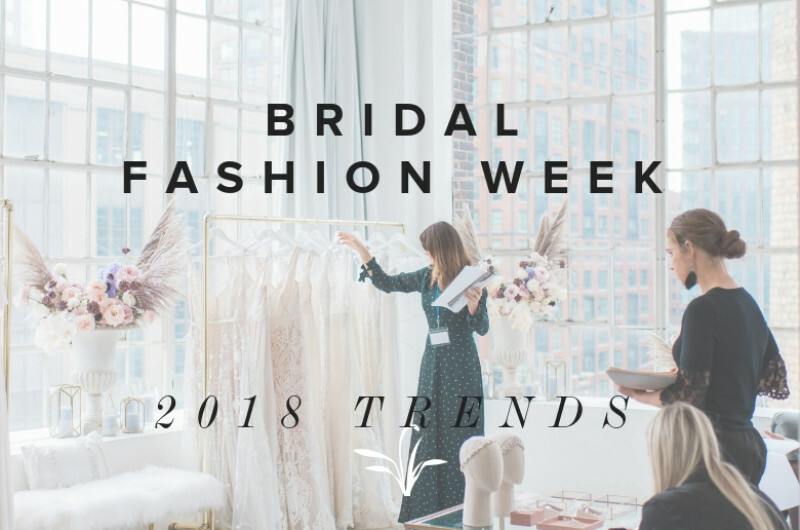 From sleeves that make a major statement and striking shoulder details straight out of the ’90s to short silhouettes and dresses designed in chic crepe, these are the six bridal fashion week trends that we’ll surely see more of next year! This season was all about the sleeves! 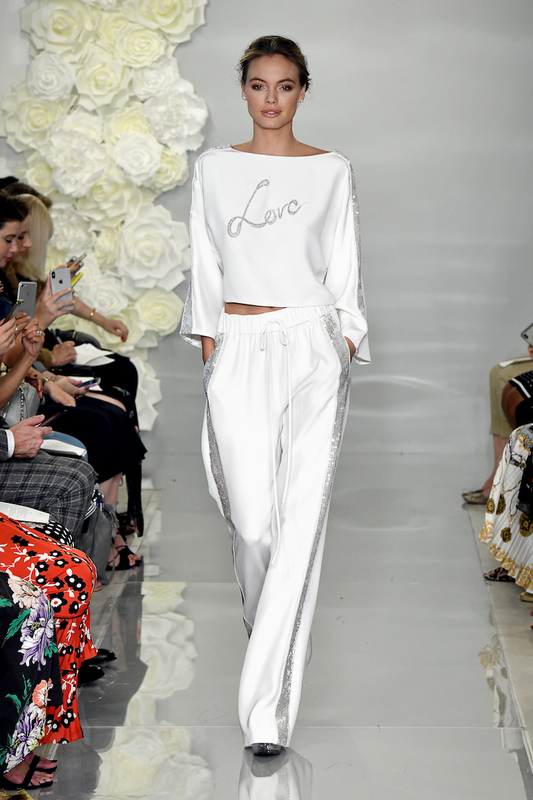 We loved the array of ways designers added drama to their dresses and pantsuits with billowy balloon sleeves, flowing floor-length sleeves, whimsical bell sleeves and beaded- and feather-adorned sleeves. For a touch of drama or an eye-catching design detail, striking sleeves both short and long were a clear favorite for fall! 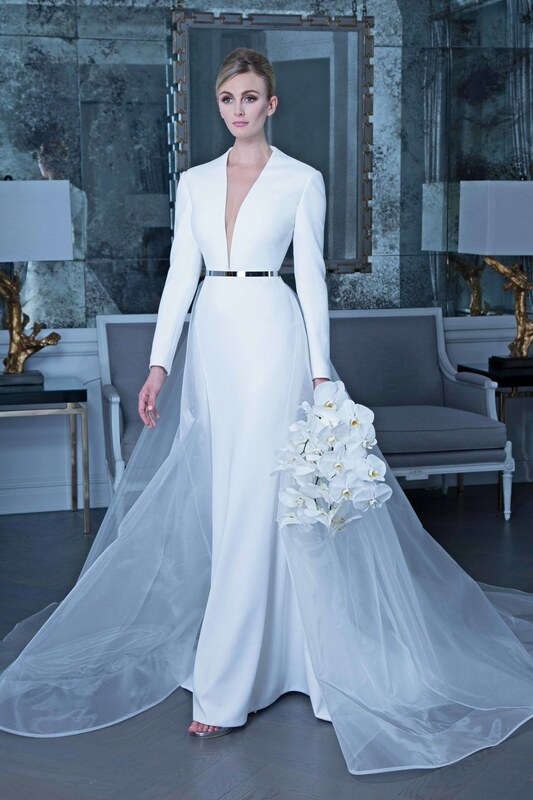 Also spotted at: Alexandra Grecco, Berta, Elizabeth Fillmore, Halfpenny London, Ines Di Santo, Inbal Dror, Isabelle Armstrong, Mark Zunino, Morilee by Madeline Gardner, Naeem Khan, Pnina Tornai, Pronovias, Randy Fenoli, Reem Acra, Rime Arodaky, Rivini, Theia, Willowby by Watters. When it comes to chic, crepe is the answer! The luxurious fabric was prominent on a number of runways this season and draped into a variety of silhouettes that made us swoon. Crepe is particularly on trend for the minimalist soonlywed who’s seeking a look without many added embellishments. But just as it can stand alone, it also pairs beautifully with delicate lace or embroidered details, making its versatility one of its best qualities. Also spotted at: Amsale, Anne Barge, Isabelle Armstrong, Justin Alexander, Laure de Sagazan, Pronovias, Rime Arodaky, Tara LaTour, Theia, Watters. Just as sleeves made a major statement on the runway this fall, shoulders had their moment in the spotlight, too! We’re talking puffed and padded shoulders straight out of the ’90s that got a modern update for the 2019 runway, and we couldn’t love it any more! For the soonlywed who loves taking style risks, this fun trend is a must! Also spotted at: Gracy Accad, Inbal Dror, Viktor & Rolf. 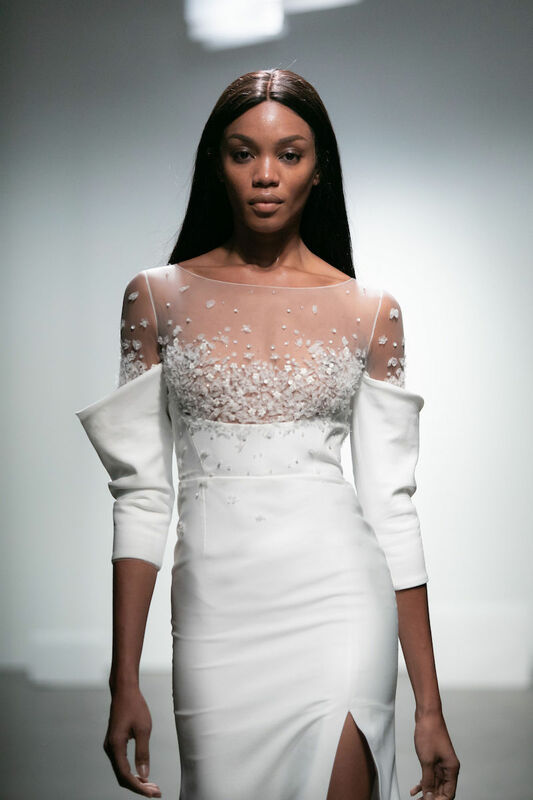 High-neck wedding dresses were a trend for spring 2019 collections, but for fall, we’re seeing the neckline extend even higher! With a sleek look that adds a modern, eye-catching element, the mock neck is sure to stay. Also spotted at: Amsale, Berta, Gracy Accad, Inbal Dror, Justin Alexander, Julie Vino Group, Pnina Tornai, Rivini, Romona Keveža, Theia. Short, playful silhouettes make for the perfect party dress, which is why we love that so many designers included a short style in their collection this season! While we saw a lot of tea-length dresses last fall, this season’s hems have gotten even shorter, encouraging soonlyweds to step into something a little more dance-friendly for after the ceremony. With fun beaded details and flirty fabrics, the short dress is staking its claim in wedding fashion! 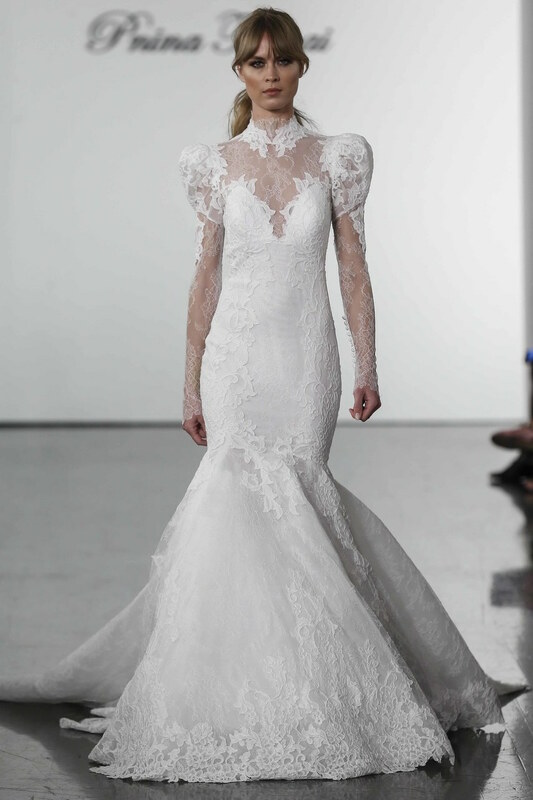 Also spotted at: Amsale, Berta, David’s Bridal, Elizabeth Fillmore, Gracy Accad, Inbal Dror, Rime Arodaky. 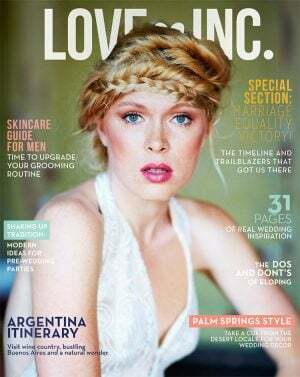 We’re seeing more and more designers consider the entirety of a wedding day from start to finish as they design their collections — whether that’s creating convertible pieces and transformable looks for ceremony to reception to after party, or, as we saw this season, designing special looks that are perfect for pre- and post-wedding festivities! 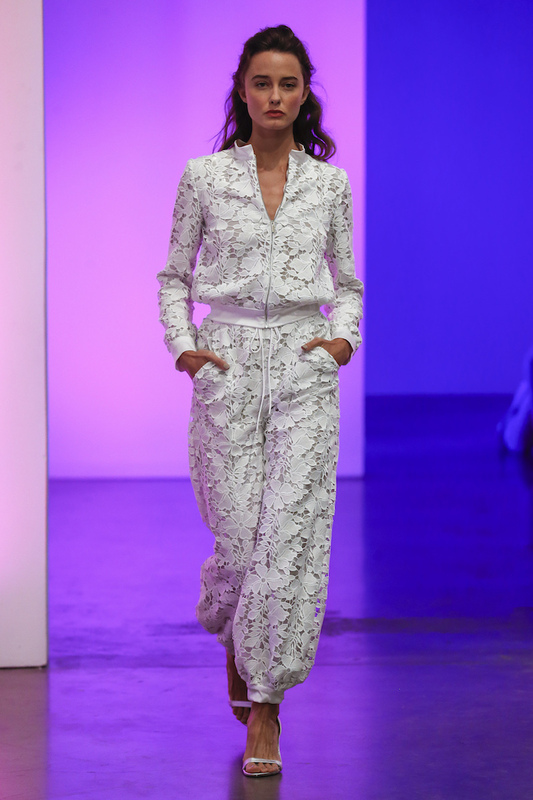 These chic tracksuits by Gracy Accad and Theia are great for running last-minute wedding errands, getting ready in the morning or jetting off on the honeymoon, which is why this is one trend we hope really takes off!